What's wrong with the picture above? Well, it is measuring the temperature of the fridge (top) and freezer (bottom) sections of our meat curing fridge. The top number should be more like 55°. This wasn't a complete surprise. It actually was dead on delivery. When it arrived, we plugged it in, noted that it was running, and waved goodbye to the delivery guys. A few hours later when the interior had actually increased in temperature, we knew we had a problem. According to the repair guy, the problem was pretty clear - no freon. He couldn't find a leak, so he filled it up and we hoped for the best. Turns out we only got two weeks out of it. Our guanciale is done, but our sausages still have a week or so to go. We're trying to figure out the best way to save them. Update 2: The freon leak is now (we hope!) repaired. Curing has resumed! Not for nothing, but a lotta guys cure at 62 degrees anyway, and once a salami has been aging a while, the increase in temperature can be a good thing. Upshot: No harm done...except to your wallet. Thanks for the advice, Hunter. 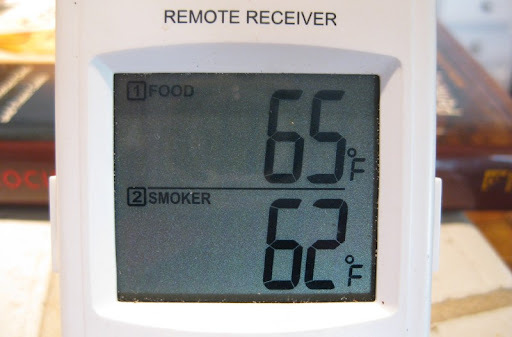 When faced with the "chamber failure" (the temp was 65 and rising), our main question was whether to remain at a higher non-refrigerated temperature, or just refrigerate. Our decision was to leave it out, but fortunately, we didn't have to do it for long. We weighed the sausages today, and they've lost about 30% of their weight so they may be pretty much done. They still feel a bit soft to touch, though, so I think we'll let them go a bit longer. I've been enjoying your site for several months, especially the Charcuterie posts (and the beer posts). I recently finished curing pancetta and soppresata in my basement, where the temp fluctuates a bit. But I've still had great success. I've just posted about the pancetta at www.cookingbabbo.com and will be posting about the soppresata shortly. I look forward to hearing how your fridge works out. Hi David - we've had very good success with pancetta under non-ideal temperature conditions as well. It seems to be pretty tolerant. I've also read about doing it at normal fridge temperatures - it just takes longer. We've never done soppresata, so I'll be curious to see yours. Sorry to hear about your unfortunate episode, but so thrilled and amazed to see what you guys have been doing since i stopped by last time. The sausages and the gunciale made my mouth water so badly.... I think to forget about it a have to finally get out those photos with the sausages from Christmas, maybe i'm not going to feel so hungry anymore. Roxana - we haven't tried the guanciale yet, but we had our first taste of cured sausage today. It was very good - we'll post some pictures soon.